We’d love your help. 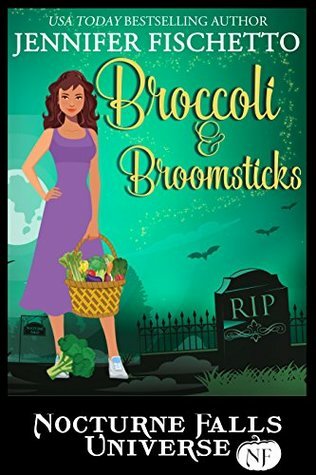 Let us know what’s wrong with this preview of Broccoli & Broomsticks by Jennifer Fischetto. Her plans implode when a zombie infects her brother, Gio, and a cute hunter wants Gio dead. Aria will stop at nothing to find a cure, but things go from i Aria Ricci wants the last three months of high school to be as uneventful as possible, which isn’t easy when you are powerless in a family of magical witches and live in Nocturne Falls, GA, a haven for paranormal beings. To ask other readers questions about Broccoli & Broomsticks, please sign up. This is an entertaining, quick story in the Nocturne Falls Universe. The author has crafted a story with interesting and vivid characters, a bit of a mystery, and romance. I look forward to reading more from this author in the future. I received a copy of this book from the publisher, my review has been voluntarily submitted. From the Nocturne Falls Universe Kindle world. A town of paranormals that celebrates Halloween every day. Young adult. Zombies of the non-violent variety and a hunter. Vegan zombies. Witches. First attraction, learning young love. A short mystery style novella. With a funny tag line: No hood, no entrance. This is a great book; this book is part of the Nocturne Falls Universe and is written by Jennifer Fischetto. The Nocturne Falls series is written by Kristen Painter and I was so happy that these new books by new authors were asked to write a story in the town. Nocturne Falls is a town that celebrates Halloween every day of the year and also a place that paranormal’s can live and not have to hide what they really are. Aria Ricci comes from a powerful family of witches, the problem is she doesn’t This is a great book; this book is part of the Nocturne Falls Universe and is written by Jennifer Fischetto. The Nocturne Falls series is written by Kristen Painter and I was so happy that these new books by new authors were asked to write a story in the town. Nocturne Falls is a town that celebrates Halloween every day of the year and also a place that paranormal’s can live and not have to hide what they really are. Aria Ricci comes from a powerful family of witches, the problem is she doesn’t have any powers. When her brother Gio gets infected by a zombie she is determined to do anything to find a cure including getting the good looking zombie to help her. This is a great book with a wonderful story and well developed characters. This book will keep you reading long into the night. If you are looking for a great book, then you need to read this book. I am looking forward to reading the next book by this great author. I voluntarily reviewed an advanced reader’s copy of this book. The free book held no determination on my personal review. I have to admit that among all of NFU books (and I’ve read them all), I like this one the least. I skipped so many chapters because I didn’t find it compelling. The way the story wrote was good, flowing effortlessly. However, the story itself was just lacking. The main characters were okay, yet the supportive characters were not supportive at all. They’re so annoying to the level that I didn’t want to read about them. Unfortunately, the supportive characters parts were quite a lot, thus the skipp I have to admit that among all of NFU books (and I’ve read them all), I like this one the least. I skipped so many chapters because I didn’t find it compelling. The way the story wrote was good, flowing effortlessly. However, the story itself was just lacking. The main characters were okay, yet the supportive characters were not supportive at all. They’re so annoying to the level that I didn’t want to read about them. Unfortunately, the supportive characters parts were quite a lot, thus the skipping. Oh, and in terms of compatibility with the original Nocturne Falls, how on earth supernatural that hardly could control their power lived in NF? Aria is from a family full of witches but her powers never came in. Which makes life tough being the only normal in the family. But when her brother Gio is bitten and turns into a broccoli craving zombie she’s determined to keep him alive and stop the cute hunter who’s determined to put an end to him. This book was different, but really enjoyable. I mean zombies that eat broccoli over brains. Vegan instead of carnivore was actually a lot of fun to read and have a little giggle over. And of course Aria is from a family full of witches but her powers never came in. Which makes life tough being the only normal in the family. But when her brother Gio is bitten and turns into a broccoli craving zombie she’s determined to keep him alive and stop the cute hunter who’s determined to put an end to him. I enjoyed this book. It gave an interesting and unique spotlight on cruciferous vegetables. The characters were great. The only thing that bothered me was, she put off telling her mom what happened. Until mom found out. Since I'm a mom, and not a teen, this bothered me. It was explained in the story line. So it's just me. About halfway through the plot picked up and it became a real page turner. Great addition to Nocturne Falls Universe. This is one of the best books in the Nocturne Falls Universe. It sucked me right in from the very beginning and held on tight. This author has such an amazing imagination. What a neat idea to do with zombies! While the characters were in high school, it read like a grown up read also. My favorite part was how funny it was. I couldn’t stop laughing at the clever humor added. This story is a part of the Nocturne Falls Universe series. It features Aria and her family who are earth witches. Aria’s brother gets turned into a zombie and she ends up meeting Malik who is a hunter. Through some simple twists and turns Aria discovers her powers as well as the cause of the zombie infection. Aria's brother Gio is infected byh a zombie. This book is Aria's journey in finding a cure for her brother. Part of the Nocturne Falls Universe, a fun read about a young no powers witch , her witch filled family, zombies, and hunters make for a very fun exciting adventure!!! This was a fast paced read with light humor and romance. It was well written with an interesting character pool centered around Aria and her family. Interesting concept by having a broccoli loving zombie! Hopefully we’ll see more from this author in the NFU! It’s always great to visit Nocturne Falls. This is a cute romance that involves zombies and vegetables. Really enjoyed this book, it was a fun read. I liked the pairing of Malik and Aria! Wow first zombie story worth reading. I avoid zombie stories like the plague. This one is short, to the point and has a decently happy ending. Well done. Cute book. It is a young adult version, but i really enjoyed it -- even though I am not a broccoli lover. I enjoyed this story. It was cute not tense and rather amusing. The end felt a bit abrupt. Love the stories about Nocturne Falls. Kristen Painter, l've read about everything she's written. Love her imagination. Feels like l'm right there witnessing the story. Love her writings. Loved this book. Really enjoyed the characters. Look forward to reading more for her. Two and a half stars for the effort. This is the first book in the Nocturne Falls Universe from this author and I am not sure that I want to read more as I was unable to complete this book. I have never rated a book this low and I hope I never will again. And I will explain why. But firstly I would like to clarify trhat there is nothing wrong with the author's writing style, it is the content and the opinions the author conveys in her writing that made me drop the book like a hot potato. It start Two and a half stars for the effort. It started well enough girl goes out with his brother, brother gets turned into zombie and she brings him home to tell the family so they can all together find a cure. this is where all starts going horribly downhill. We meet the girl's family. First we have the girl, Aria, the only witch with no powers in a family of powerful witches. She has a sister and two brothers, I did not bother with the names. Then there is mother, father and a grandmother and they all live together in one house. It seems that none of them can control their powers when they get upset and the family could not be more disfunctional, unsupportive, and for the lack of better word, disguisting. There is absolutely no love or special relationship between anyone in the house. Mother gets upset and unreasonable a lot and then she causes hurricanes or storms or something. Father is overly annoyed with the mother so he never pays attention to anything she says or does. The older brother is only concerned about his new car. The youger brother is a bit stupid and the grandmother alternates between judgemental and demented. Exactly the type of family I want to read about. Not. Ever. Okay, so all of that was based on few pages, just first impressions, and I was ready to continue and give the book a chance regardless of the wanton distruction caused by this family's unrestrained powers which is a major discrepancy from the main rules of Nocturne Falls. What broke my will to continue is when Aria's sister who is a few years older, twenty or twenty one, in any case adult, she comes home and anmounces that she is pregnant. next 10% of the book mostly concerns judgemental usupportive rants from various members of the family regarding the pregnancy: Who is the father? She is so stupid? How could she do this to us/me? and on and on in that tone. Naturally, the author has a right to express her viewpoint on that matter but that does not mean that I have to read it. I think this kind of judgemental opinionated writing is simply irresponsible as young adults might read this book and some of them might be in a similar situation. Freedom of choice goes both ways and it is no one's business who the father is unless the woman decides to disclose it. For all we know she might have been raped and not ready to disclose it. I have no idea what happened because I refused to read further, but I doubt there was anything the author could have done after this to make it readable for me. However, the rest of the fantastic Nocturne Falls series, I highly recommend. I write dead bodies for ages 13 to six-feet-under.